Start your journey into the ARM Microcontroller Development with this beginners kit based around the STM32F0 series. Includes all you need to get started! You want an ARM microcontroller kit that will have the components to get you deep into circuits that take advantage of many of the STM32 feature set. Consider this microcontroller kit based around the STM32F0 series. These leads are great for grasping wires and resistors that are otherwise difficult to test with regular multimeter or oscilloscope leads. Communicate wirelessly with this Bluetooth module and use it in your next microcontroller project. This is a 3 axis magnetometer. The magnetometer provides a compass by sensing where the strongest magnetic force is. This board communicates through i2c and will work with 3v-5v microcontrollers. Use this device for sensing temperature without having to use a special connector like with a a thermocouple. The specified temperature range for this probe is -20 to 500 degrees Celsius. Push button switches are used to provide input to microcontrollers and electronics. Press the button to complete the circuit. This is just like the regular push button switch except it has an LED which can provide visual feedback. A PIR sensor is used to sense motion (usually human motion) within a specified range. They detect small amounts of radiation using an IR sensor. In this video, you will get a ton of detail on software debouncing. I demonstrate the bouncing on the push button and show the results on an oscilliscope. Additionally, I show how to program the software debouncing code into a library for very easy implementation within the while loop. This is a must see video, and by watching, you are supporting the content that I serve. I take you by the hand through the process of progrmming the I2C / TWI protocol in this video. This is exclusive content that, if you are willing, you can become an expert in communicating with the I2C. This is territory that few will master, but if you watch the video, you will! In the video, I demonstrate the programing needed to communicate with a slave through the I2C protocol. The slave, in this case, is an accelerometer (ADXL 345). I take you through the complete process of programming and testing. In the programming portion, you will learn what is required by the master and the slave to establish the communication. In testing, I probe the SDA and SCL lines and show you the data that was transmitted over these lines and what the slave returned. Demonstration of the funtamental signal requirements and timings and then show examples of circuit and code to establish communication. Explain the fundamentals of encoders and how encoders can determine position for a greater mechanical system. This typically requires PID (Proportional Integral Derivative) closed loop control and a thorough detailed explanation of this type of control will be investigated. Various encoder types will be examined along with various types of motors and mechanical advantage (gears, pulleys, chain, etc.). This will require some prerequisites in signal theory, which I will explain. I will do a run-down of the different types of servos out there and how they function. I will also get into the details of closed-loop control. PWM is the method used to control non-digital hobby servomechanisms. I will show how to simply control the servo using the 16-bit timer and the PWM channels. PWM will still be the method to control the hobby servo, but we may want the microcontroller to drive more servos than the number of standard PWM channels will allow. Therefore we will investigate a method that uses standard pins as PWM output to control many servos. We will investigate the programming necessary to create a closed-loop system that reads an encoder and positions a motor to create an overall servomechanism. Do you want to control a household device? Using a relay and a spare output pin on your microcontroller can do the trick. In this tutorial, we will control the stuff that would be plugged into the wall outlet. Enough of this 5v limit. With Mosfets, you can send higher DC voltages to devices that would function better above the 5v limit that comes out of the microcontroller. 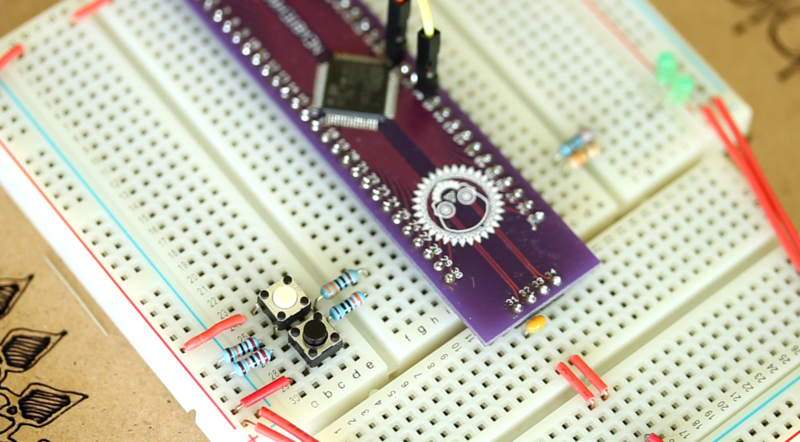 This tutorial is a precursor to motor control using PWM. We will control the brightness of an LED and make it fade in and out softly. Is your LCD taking up too many pins? In 4-bit mode, the LCD will only need 4 data lines--so your microcontroller can free-up 4 of the pins for other uses. The basic fundamentals of serial communication will be explained in this tutorial. Universal Synchronous Asynchronous Receiver Transmitter is the serial communication function in the microcontroller. We will communicate to and from the computer via RS-232 (with the help of the Max232 chip to adjust voltage levels), and we will also communicate with a digital servo with a single wire to serve as both TX (Transmit) and RX (Receive). This tutorial will delve into motor control. Using PWM, we will be able to increase and decrease the speed of a motor and even change motor direction. This tutorial will explain the process necessary to create a schematic in Cadsoft Eagle, layout the PCB (Printed Circuit Board) and build the prototype. Learn how to use transistors in your microcontroller projects. In this tutorial, a small low-current stepping motor will be controlled by the pins of the microcontroller. A larger stepping motor will be controlled using Mosfets and a separate higher voltage source; however the microcontroller will still be providing the control logic to these Mosfets. As an alternative to Mosfets, I will select various driver chips on the market today and use those to provide the high-powered driving current, again under the direction of the microcontroller. This is where things get interesting with stepping motor control, since the microcontroller now becomes a processor for much broader control--with only the need to send out step pulses and a high/low signal for direction control. Alternative clocks such as crystals, RC circuits and others will be explained and connected to the microcontroller. We will use these devices to adjust the frequency of the microcontroller. Imagine what you could do with many output pins! Do I hear...LED array? We can also investigate using this device to communicate to the LCD with only a few wires. PIR (Passive Infra-Red) sensors will be explained and we learn to control these devices with the microcontroller. We will connect an ambient light sensor to the microcontroller, and check its reading on the LCD. Inter-Integrated Circuit is a type of communication that is common with many sensors and devices. I will probably start with an accelerometer that communicates using this technology. An Infra-Red distance sensor will be connected to the microcontroller, and the information will then be displayed to the LCD. An ultrasonic distance sensor will be connected to the microcontroller, and the distance displayed to the LCD. I will do a survey of the wireless options that can be used with microcontroller and explain each of them. We will communicate with another device using wireless radio frequency communication. We will investigate the use of Xbee and Zigbee products for wireless network communications. A GPS module will be interfaced to the microcontroller. The information will be parsed and delivered to the LCD. We may do some other interesting things with GPS as well. Other Microcontrollers, such as the ARM and PIC will get tutorials of their own. When I begin with these tutorials, I will start another list. Did I mess anything? Let me know!